Tickets : €10 online / €12 on the door – Ticket link announced on Wednesday, November 7th. As the silly season fast approaches, we here at Tír na nÓg would like to extend an invite to EVERYONE to join us for jigs, jives and jokes at our special Christmas Winter Party in Connolly’s of Leap. On the night we have special guest DJ Deece, party guru’s The Hanley Brothers, County Vinyl, Kieran and Ciaran. DJ Deece is the man that will be closing out our special night, the Irish man has rubbed shoulders with many of the worlds top Dj’s while being featured by The Boiler Room, his headline sets at Electric Picnic, Longitude, AVA Festival, Body & Soul, Forbidden Fruit….need we say more? The man brings magic. 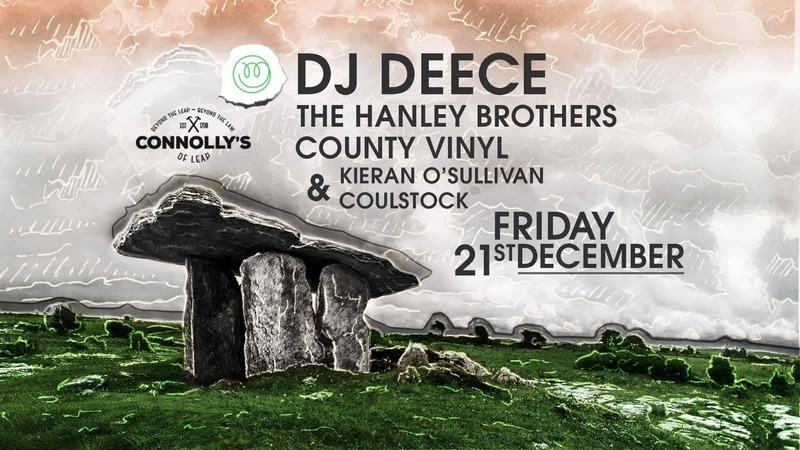 The Hanley Brothers, County Vinyl, Kieran and Ciaran return to the wild wild west to kick things off in what promises a night to remember. We would like to thank everyone who has come and danced with us in the land of Tír na nÓg at Connollys, so far its been incredibly special and we hope to see you there for another night of antics!